When you’re in the market for a new car in Alberta, you need a vehicle that can pull you through the long winter, a vehicle that has a ton of safety features, standard All Wheel Drive, enough space for your lifestyle and it definitely wouldn’t hurt if it was fun to drive come summertime. Nissan’s mid-sized sedan—the Nissan Altima—checks off all of those Alberta-essential boxes off with ease. Here at Go Nissan North, your leading Edmonton Nissan dealer the Nissan Altima has a competitive starting price of just $27,998! Come down to Go Nissan North to learn more about what the Altima can offer you, and explore the rest of the Nissan lineup. We’re also proud to serve the communities of St. Albert and Morinville! Choose a stand-out sedan with the all-new Nissan Altima. 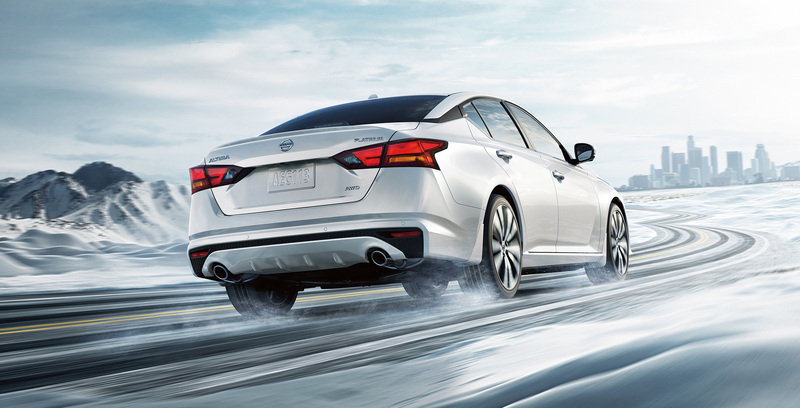 Powering the mighty Altima with 188 horsepower is an efficient 2.5-litre DIG engine. Get yourself through your daily commutes with a fuel efficiency rating of 9.1/6.5 L/100km (City/Hwy). Drivers can also be treated to an abundance of available luxurious technology and safety features from Nissan for an unbeatable price. Enjoy a semi-autonomous driving experience with Nissan Intelligent Mobility™, including both ProPILOT Assist and Intelligent Around View Monitor with Moving Object Detection.